All information contained in our database is supplied by the member businesses to the OCCVB for inclusion in our database. 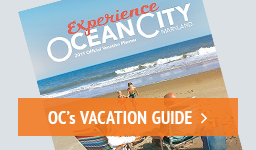 This is not a complete listing of all businesses in Ocean City Maryland. The OCCVB does not take any responsibility for the accuracy of the information supplied to us by the individual businesses. If you want to know any specific information about the accommodations, goods, or services offered by any particular business in our database, you will need to contact that business directly.